For other places with the same name, see Vienna (disambiguation). Vienna is a huge city with several district articles that contain information about specific sights, restaurants, and accommodation. Vienna (German: Wien; Austro-Bavarian: Wean) is the capital of the Republic of Austria and by far its most populous city, with an urban population of 1.9 million and a metropolitan population of 2.4 million. It is by far the largest city in Austria and the country's artistic, cultural, economic and political centre. It is known for its high living standards, relaxed yet elegant lifestyle and rich musical life. The thing about Vienna is that it not only is a large city, but that it has always been – as the former home of the Habsburg court and its various empires, it has always housed a large population and enjoyed a privileged position, being home to many artists, especially composers including Beethoven, Haydn, Liszt, Mozart, Schubert and Johann Strauss II. It was long the largest German-speaking city in the world before being surpassed by Berlin. The large historic city centre of Vienna filled with monuments to its imperial past is inscribed on the UNESCO World Heritage List. Vienna is broadly divided in inner (1–9) and outer districts (10–23). The 23 districts or wards each have a name and a number. They vary immensely in size and each has its own flair. These function subordinately to the city as decentralized administrative branches of the commune, and make local decisions. We've divided official 23 districts of Vienna into 13 here for travel purposes. The central Old Town and most important part of the city where most sights and tourists can be found. The third district is the largest inner district including the Belvedere Palace, the Schwarzenbergplatz, embassies and an industrial hinterland. The fourth district starts from Karlsplatz with the famous Karlskirche and borders the Naschmarkt with a miniature Chinatown. The outermost inner district is mostly a residential area. The sixth district continues on from the Naschmarkt up to the Mariahilfer Straße. It has popular bohemian neighborhoods. The seventh district features the acclaimed MuseumsQuartier, which connects directly the modern museums to the classic museums of the inner city, plus other artsy spots. The eighth district is the smallest inner one and is mostly a classy residential area. The ninth district has the Vienna University and several hospitals. 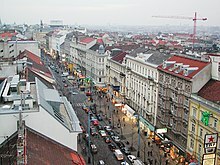 The second district used to be the Jewish part of the Vienna town. It stretches from the more wild forests of the Prater to the newly gentrified areas of the Karmeliterviertel and Augarten. This groups outer districts that are traditionally worker-oriented in the south of Vienna. The 13th district is a more residential area with the Schönbrunn palace and old villas. The attractions around it account for the most Viennese tourist visits. This groups outer districts, which are more worker oriented (14, 15) the newly hyped and multicultural (16), more bourgeois area (17) and the upper class (18, 19). All of them bordering the Wienerwald and often allowing great views on Vienna. This groups outer districts containing the regional United Nations Headquarters and including a mix of farms, suburbia, Soviet-style housing blocks, villages. Most of the historic core of Vienna has already been in place in early 1700s – do note the fortifications later replaced with the Ring. The low-lying Danube plain in and around what is now Vienna has had a human population since at least the late Paleolithic (see Prehistoric Europe); one of the city's most famous artifacts, the 24,000-year-old Venus of Willendorf, now in Vienna's Natural History Museum, was found nearby. Vienna's own recorded history began with the Romans, who founded it in the 1st century CE as Vindobona, one of a line of Roman defensive outposts against Germanic tribes. Vindobona's central garrison was on the site of what is now the Hoher Markt (the "High Market" so-called because of its relative height over the Danube), and you can still see astounding excavations of its foundations there today. Given its prestige, Vienna hosted the Habsburg court for several centuries, first as the Imperial seat of the Holy Roman Empire, then the capital of the Austrian Empire, and later of the Austro-Hungarian Empire, which finally fell in 1918 with the abdication of the last Emperor Karl I. The court tremendously influenced the culture that exists here even today: Vienna's residents are often overly formal, with small doses of courtliness, polite forms of address, and formal dress attire. One distinguishable paradox of the quirky city is that its residents can be equally modern and progressive as they are extremely old-fashioned. Vienna existed even as early as the ancient Roman Empire – the ruins of what was then called Vindobona can be seen right in the city centre. The empires also served to make Vienna a very metropolitan city at an early time, and especially so through the years of industrialization and fall of the Austro-Hungarian Empire at the turn of the 20th century. Imperial Austria and Austro-Hungary were multilingual, multi-ethnic empires and although the German speakers normally played the dominant role in Vienna there has long been ethnic and linguistic diversity in the city. Proof of Jews in the city dates back to 10th century. After World War II many of the city's minorities had been exiled or killed and much of the city lay in ruin. When Austria was given sovereignty after the post World War II occupation, it was eventually established that Austria would be neutral and not join the Eastern Bloc. So the city became more isolated from its previous ties to its Slavic and Hungarian neighbors; the east of Austria was surrounded by the Iron Curtain. 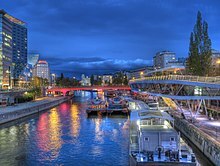 Vienna had gone from being the well-established metropolitan city of Central Europe to the capital of a small, predominately German-speaking nation of states with strong regional identities. But when the Iron Curtain came down in the early 1990s an influx of immigrants and Yugoslav refugees came to Vienna. In 1995 Austria joined the EU and her neighbors to the east joined in 2004. In addition Vienna became the gateway to Eastern Europe due to its imperial past and location, with many multinationals having offices there and many Austrian companies investing in Eastern Europe. These series of events helped the city rise from the ashes. Vienna once more sits at the heart rather than at the edge of Central Europe, with connections that had been severed for decades slowly but surely being re-established. Since the formation of the first Austrian Republic and the first mayoral election 1919, the Social Democratic Party of Austria has had the majority of representatives on the common council and controlled the mayoral seat. During the early years, the socialist Red Vienna ("Rote Wien") revolutionized the city, improving the extreme conditions that the industrial revolution and rapid urbanization had created. Most famously the city built many housing projects (housing estates or "Gemeindebauten"), and they also began to offer many social services and made improvements across the board in quality of life. The public housing that was built at that time is now famous for its distinctive style. To this day the city continues to build public housing and about a third of the city's residents live in it, some 600,000 people! Through this high percentage, the quality, and the integration of public housing across the city have kept it from becoming as stigmatized as in most cities. The Viennese are used to having the city government in their lives, and of course have a love-hate relationship with it. Vienna functions on its own as a federal state in the Austrian system (along with 8 other states) and the sense of local pride and home is more of being Viennese than being Austrian, many say. Vienna was the host city for the Eurovision Song Contest, Europe's largest live televised event, in May 2015. Common points of reference are often used in Vienna in addition to districts, most notably public transportation stops. Reference to U1/U4 Schwedenplatz or Schwedenplatz (U1, U4) means that something is near to the Schwedenplatz stop on the underground lines U1 and U4. Normally if the place is not directly at the subway stop you can ask around and find it easily. The Vienna Tourist Board operates information and booking booths at the airport Arrival Hall, 07:00-23:00 and the 48.20449316.3693211 Tourist-Info in the center at 1., Albertinaplatz/Maysedergasse (9:00-19:00). Information and free maps are also available from the ÖBB InfoPoints and offices at train stations. The city has a very centralized layout radiating from the historic first district with the Stephansdom and Stephansplatz at the centre of a bullseye. It is encircled by the Ringstraße (Ring Road), a grand boulevard. Districts 2-9 are considered the core districts and are gathered within the Gürtel (Belt Road), which encircles the core districts as an outer ring concentric to the Ring around the first district, with the notable exception of Leopoldstadt (2). The outer 14 districts are largely less urban but are equally as diverse. Winter in Vienna can be just above 0°C (32°F) and drizzling for days on end, or just below with dustings of snow that manage to melt again quickly. There is the occasional cold snap where it will stay below freezing for a week or two at a time. Due to Vienna's relative easterly position in the Central European Time Zone its daylight hours (if it's not too gray outside entirely) are relatively early during the winter. The vast majority of shops, restaurants, and cafes are closed on Sunday. The main exceptions are shops and restaurants located in train stations, flea markets, a few small family-run outfits, and tourist oriented souvenir shops. Many museums and other attractions are also closed, and the public transportation system runs less frequently and keeps different hours. If you plan to visit anything on Sunday, be sure to check if it will be open. Besides visiting museums and churches, a stroll through the Prater or a hike in the Wienerwald are good Sunday activities. 48.11027816.5697222 Vienna International Airport (Flughafen Wien-Schwechat VIE IATA) (just outside the city limits of Vienna on the far side of the City of Schwechat). To get to Vienna, you have three different railway options. The cheaper but slower S-Bahn line S7 (24 minutes; € 4,20) and the more expensive but faster City Airport Train (15 minutes; from € 11) both go to Wien-Mitte/Landstraße. To Wien Hauptbahnhof (central station) and onwards there are long distance trains leaving every 30 min (15 minutes; € 4,20). There are also buses (Vienna Airport Lines) and taxis. For details on the airport transfer see the Vienna International Airport article. FlixBus. 06:00-23:00. Services leave approximately every hour, but check schedule. Leaves from the airport terminal building and arrives at Erdberg (U3) in just over an hour. €4-10 each way. Postbus/Slovak Lines (Bus), ☎ +43 810 222 333 (Austria), +421 18211 (Slovakia), e-mail: airportlines@postbus.at. 08:00-18:35. Leaves from the airport terminal building and arrives to Südtiroler Platz (U1) in under two hours. Intermediate stops in Bratislava, at Vienna Airport, some at Erdberg (U3). Check schedule. €5, €8 return. Early departing flights:. Take a cab or spend the night at a hostel or at the airport or take the early train leaving from Wien Hauptbahnhof (~05:20) to Bratislava hl. st. (arriving ~06:30) and then take bus No. 61 to the airport (or take a cab). It is possible to catch 08:00 flights this way. Rosenov Airport Transfer, ☎ +43-1-485 77 77. M-F 09:00-18:00. Offer a flat rate transfer to/from Vienna. €75. Some other smaller airports in the region are served by budget airlines: Linz (2 hours by train), Graz (2.5 hours by train), and Brno (2.5 hours by train or bus). The station names of all stops in Vienna start with its German name "Wien". This is internationally recognized and helpful for buying tickets. The railways are managed by the Austrian Federal Railways ÖBB. Read more about train travel within Austria and reaching Austria by train. 48.18516.3777783 Wien Hauptbahnhof abbreviated Wien Hbf. The city's main train station, where most international and long-distance domestic services call. Like Paris or London Vienna had inherited several rail terminals from the 19th century unlike the former and similar to Berlin the situation was addressed in the 21st century with most trains now serving Hauptbahnhof which is as impressive as you'd think if a newer building. All ÖBB long-distance services have been moved to this station. 48.17516.3352784 Wien Meidling. Where all services stop arriving from the west and the south towards the Hauptbahnhof. If your final destination is in the west or northwest of the city, you can save significant time if you alight in Meidling instead of Hauptbahnhof and continue with the Metro U6. 48.19666716.3377785 Wien Westbahnhof. The services from Salzburg run by the private company WestBahn terminate here. Apart from it, only regional trains serve the Westbahnhof. Westbahn also serves a few other otherwise regional stations such as Wien Mitte and Wien Praterstern. There are very frequent trains for all neighboring regions and countries. Night trains and quicker Euro-City trains arrive from virtually every city in Central Europe. High-speed ICE and RailJet trains arrive from places like Munich, Budapest and Zurich. There are frequent (at least hourly) regional trains to Czech, Slovak and Hungarian border regions. The special fare is named Sparschiene and must be booked quite in advance. It is available for high-speed trains. Those cities are served by the Austrian Railjet or German Inter-City-Express (ICE) high-speed trains. Some of those services to Vienna also call at Cologne, Duesseldorf, Stuttgart or Wiesbaden, as well as major stations in between, with lesser frequency than listed above. Even fewer services start as far out as Hamburg, from where the ICE takes 9 hours to reach Vienna. The Railjet can accommodate bicycles, whereas the German ICE cannot. The classic overnight train Metropol from Berlin was discontinued in December 2017, but returned as a ÖBB Nightjet train in December 2018, running via Frankfurt (Oder) and Wroclaw. The Nightjet is offering two lines from Vienna to Germany, Line NJ490 is running from Vienna via Linz, Regensburg, Nuernberg and Hanover to Hamburg, Line NJ40490 is running from Vienna via Linz, Regensburg, Nuernberg, Frankfurt and Cologne to Duesseldorf. There are two companies operating trains between Prague (via Brno) to Vienna. Czech Railways (ČD) operate jointly with ÖBB a railjet service every two hours with prices varying mostly between 15 and 30 € (bookable online or at a ČD ticket office). After cheap tickets are sold out at ČD, there may be some more at ÖBB. Another option is to take a private RegioJet train, which links Prague and Vienna four times a day for a similar price but with a different concept of on-board services. In the Czech Republic, railjet trains are abbreviated as rj and RegioJet as RJ, Both ČD+ÖBB and RJ accept InterRail passes but they do not recognise each other's tickets. The ÖBB also sell one-way 'SparSchiene' to Brno (€12), Ostrava (€14) and Prague (€29). Its cheaper to just get this to Brno and buy an onward domestic ticket to Prague (€5-10), and there is better availability than with the single Prague ticket. EURegio tickets are valid from Vienna to cities near to the border and tourist towns, including the return ticket with-in four days; Znojmo €15, Mikulov €18, České Budějovice (Budweis) €27 or Český Krumlov €27, and Plzeň €29 (children half-price, weekly and monthly tickets available). From Budapest Keleti buy a discounted round-trip ticket, kirándulójegy (excursion or 4-day ticket) for €31. It includes the return within 4 days and is valid for all public transportation in Vienna for 2 days. So it's a deal even if you don't need a return ticket to Budapest. There are limited number of SparSchiene tickets each day for €13. All tickets are valid in all trains (including the high-speed RailJet). Trains confusingly depart Budapest East (Keleti pu), and stop at Hauptbanhof and Wien Meidling, from where they continue to Germany or Western Austria. Direct trains run every two hours or more. Otherwise transfer at Győr. To Hungary the ÖBB offers tickets from €19 to Budapest and the EURegio ticket (Vienna to Hungary and return with 4 days); Mosonmagyaróvár €12, Győr €19, Tatabánya €25, Fertöszentmiklós €19, and Szombathely €22 (children half-price, weekly and monthly tickets available). The MÁV (Hungarian Railways) do not allow combined domestic tickets when crossing the border and you are risking a severe fine if cought by conductors. To Bratislava the ÖBB offers an EURegio ticket for €16 valid for return (in 4 days) and for travel on public transportation in Bratislava on the day of arrival. Its also free to take a bike along. Each railway has an independent partnership with others, so tickets can be much cheaper to (or from) neighboring countries. A common type is the CityStar ticket that is valid for return and can be sold any station in the participating countries. Sopron in Hungary is near to Vienna (€14, hourly trains) for tickets on MÁV Hungarian Railways at that train station (operated by the Raaberbahn Railway). Hungarian prices. Bratislava in Slovakia is another nearby alternative. Most tickets must be purchased 3 days in advance, possibly meaning an extra trip to the border to buy the ticket in advance. Greece: CityStar tickets are sold between anywhere in Greece and Hungary. Bulgaria: BDZ sell the return CityStar directly to Vienna (€88), a group of 3 will pay €59 each. Conversly you'll have to go to the Hungarian Railways if you want to go the other way. Turkey: Buy a ticket to the border at Kapikule (€5 from Istanbul), get a ticket from Bulgarian Railways. Serbia: Serbian Railways sell the so-called Wien Sepzial for €70 return from Belgrade, but a cheaper connection can be made through Budapest, buying the Budapest-Vienna portion in Hungary (€56 return). Russia: There are once weekly trains from Moscow and Saint Petersburg, on Thursdays. More departures are often available during the summer season. RZD sells online tickets. Ukraine: There is a daily overnight train from Kiev (22 hr). Only one in two Viennese housholds has a car and fewer than 1/3 of the trips taken within the city are by car. However, since parking space is scarce in the inner districts and parking fees apply to all inner and include many outer districts too, it is usually a good idea for visitors to leave their car parked somewhere in the periphery and use the city's excellent subway & tram system to get to the center. The Park and Ride is available at some subway stations in the city periphery for €3 per day. The weekly rates come with a discount if you add a subway/tram ticket. For using the Austrian highway system, you will need a toll sticker ("Autobahnvignette"), which you can buy at gas stations and rest stops. There are stickers for 10 days, 2 months and 1 year. In Vienna, avoid the A23 Südosttangente at rush hour. Traffic jams are almost guaranteed there and throughout the city streets at rush hour. Parking anywhere within districts 1-10, 12, 14-17, 20, and in specially marked areas is restricted to 120 minutes (M-F, from 09:00 and 22:00) (12:00, 14:00-17:00, 09:00-19:00) and subject to a fee of €2.10 per hour unless you have a resident permit. The municipality provides detailed information on parking on their website in English. If you're unsure whether fees apply to the place you're in there's a free Android app that can help you. Payment is made by marking the time of arrival on a ticket ("Parkschein"), which can be bought at tobacco shops. If you have an Austrian cell number, you can pay by text or using a smartphone app. Commercial car parks ("Parkhaus", "Parkgarage") are available throughout the city, but these can be very expensive (for instance, €32 per day in the Parkgarage Freyung). There are two main bus stations in Vienna, and other locations where national and international services deposit passengers. Waldmanngründe on the southwest corner of Südtiroler Platz(U1, S-Bahn) is a stop with an office only for services to Bratislava, other operators have offices in the nearby streets or just operate curbside services. Praterstern on the (U1, U2 and S-Bahn) has two main bus stops, one in Lasallestraße for Tourbus services from the Czech Republic and one in Nordbahnstraße for Orangeways service to Hungary. Busstation Westbahnhof-Felberstraße/Europaplatz Felberstraße, 1150 Wien, stop of long distance-busses at the trainstation Westbahnhof. Busterminal Vienna/Stadioncenter on the east (Address: Engerthstraße 242-244, 1020 Vienna, near the metro station U2 Stadion) is a stop of the yellow Student Agency coaches. Dr. Richard, Friedrichstraße 7 (Karlsplatz (across from the Secession Building) and other stops across Vienna). Southern Lower Austria, Burgenland and Styria. The 311 Timetable makes numerous regional stops but gets to Graz in about the same amount of time as the train. Up to 4 daily buses, free Wi-Fi. Graz €21.80 (€12 cheaper than by train). WESTbus (VIB Erdberg). Klagenfurt and Graz. Twice daily. €29. FlixBus. Free Wi-Fi and a guaranteed seat. Connects seven cities in Austria. Tickets from €5. Most buses from Serbia go to VIB Erdberg (U3) whie most buses from Kosovo and Albania go to Südtiroler Platz (U1). Bus lines from Bosnia and Croatia are split between the two bus stations. Turanus.Shuttles, ☎ +38640802525, e-mail: turanus.shuttles@gmail.com. Exclusive shuttle between Ljubljana and Vienna. from €190 for a group of 5. Adria Reisen (VIB Erdberg / U2 Schottenring). Between Vienna and assorted destinations on the Adriatic in Croatia. Three weekly. €150 return. Autobusni promet d.d. Varaždin (VIB Erdberg). Direct from Zagreb. Up to 3 times daily. €35/€50 return. Croatiabus, Südtiroler Platz. Direct from Zagreb. Twice daily. €35/€50 return. Autoprevoz Banjaluka (VIB Erdberg), ☎ +387 51 306, e-mail: info@autoprevoz.org. ~9.5 hr. Banja Luka, BiH. €39/€66 return. Biss-Tours, ☎ +387 33236620. Sarajevo, Zenica. Fudeks (VIB Erdberg). Belgrade. €30/€50 return. Feniks GiZ (VIB Erdberg). Novi Sad (€25) via Subotica (€20). Daily. Onward connection from Belgrade available at Novi Sad. €25/€40 return. Jovic Travel (VIB Erdberg). Belgrade. M Tu Su. €60 return. Lasta (VIB Erdberg). Požarevac via Belgrade. Daily. €45/€72 return. Niš-Ekspres (VIB Erdberg). Niš via Belgrade. Tu W Th Su. €55 return. Srbijatransport (VIB Erdberg). Požarevac via Belgrade. Daily. €45/€72 return. Zoran Reisen (VIB Erdberg). Southern Serbia. Twice weekly. €45/€80 return. EuroBus Macedonia (VIB Erdberg), ☎ +436643014416, e-mail: eurobus_mk@yahoo.de. direct to Skopje, Tetovo, Gostivar, Ohrid, Struga. €75/€140 return. Ecolines (Südtiroler Platz). Direct from Sofia. €60/€100 return. Ecolines. Departs from Südtiroler Platz (U1). Makes regular stops along the way to Tallinn. Vilnius €85/€128 return. Kautra. Run in conjunction with Tourbus. Makes regular stops along the way to Vilnius. Vilnius €101/182 return. WESTbus (Eurolines Austria by Blaguss and Eurolines Bohemia by Touring) (VIB Erdberg). Three daily buses to Brno and Prague some with wifi and power outlets. Compare prices at https://www.elines.cz and http://www.eurolines.at Prague €19. Student Agency. Six or more daily buses with free coffee, newspapers, movies. Improved service with touchscreen in-ride-entertainment a every seat and free wifi on most buses. Departs from Lasallestraße at Praterstern. Brno €5-8, Prague €12-18. Bohemian Lines, ☎ +420 416 810 054, e-mail: info@bohemianlines.cz. Daily 08:00-20:00. Runs twice a week or more from nearby Brno. Its a cheap connection with no advanced purchase requirement, you just have to get yourself to Brno on another bus company (€5-8 from Vienna). €61+5/€107+10 return. Copenhagen €65/€117 return. Eurolines AT/Blaguss. Requires a change of bus "assisted" by the driver (guaranteed connection) in Prague. "Business class service" through-and-through, free wifi within the Czech Republic and Germany. It can be cheaper to book the same connection in advance through Czech Eurolines (from €40 Copehangen-Prague + €7 Prague-Vienna) or Eurolines Scandinavia and German Eurolines (from €18 Copenhagen-Berlin + €18 Berlin-Vienna). Copenhagen €101/€170 return. Many companies offer Intercity buses in Germany, many of them also serving Vienna. Prices tend to be lower than on the train while travel times can be significantly higher. Eurolines (Eurolines Austria by Blaguss, Eurolines Bohemia, Eurolines Deutsche Touring, BEX, Berlin Linien Bus) (VIB). These companies run one daily ("Business Class" with outlets and wifi) and one nightly joint service to Berlin. Check the respective website for sale tickets: http://www.eurolines.at/, http://www.eurolines.de/ Dresden, Berlin €15-50. Orangeways (Bratislava bus station). It's a slight detour to Bratislava (€7 by bus) to catch one of two daily buses to Berlin, but it can be a lot cheaper and the bus runs on a faster highway. Dresden €22, Berlin €30. FlixBus. Several connections from Austria to Germany. Prices from €5..
Orangeways. Cheap way to Hungary. Arrives at Nordbahnstrasse 50 near Praterstern from Budapest four times daily. More expensive at peak times, cheaper to book in Hungarian forints. Popular times are often sell out. Free hot drinks, movies, headphones on some services. Budapest €6-€14/€14-20 return. Kautra. Udine, Venice, Bologna, Florence, Rome. Tickets at VIB. Walk-up promo-fare €29 all destinations. Tourbus, a.s.. Udine, Venice, Bologna, Florence, Rome, Naples, etc. Tickets at VIB. from €40. Eurolines Polska. Polish destinations (Krakow, Warsaw) from €36/72 return. Ecolines. Departs from Südbahnhof/South Station. Polish destinations (Krakow, Warsaw) €48/€86 return. Jordan. Run in conjunction with Veolia Eurolines Polska. Discounted tickets on their Polish booking site Kraków €30, Katowice €30, Lodz €33, Warsaw €35. Walk up one-way/return: Katowice €38/€68, Łódź €41/€73, Warsaw €43/€77. Kautra. Run in conjunction with Tourbus. Krakow €46/€83, Warsaw €61/109 return. PolskiBus. Cheap, bucket-priced bus around twice daily to Katowice and Warsaw. Departs Südtiroler Platz. Warsaw (via Katowice) from €1. Atlassib. A daily overnight traveling across Romania to Vienna, book through Eurolines.at or with Atlassib. Bucharest €59/€94 return. Eurolines RO. Extreme arrival times in Vienna (02:45) and departure times depending on origin and destination. Bucharest €124 return. Turanus.shuttle, ☎ +38640802525, e-mail: turanus.shuttles@gmail.com. Fast minibus service. Reservations required by phone, website or email. €120. Blaguss. 10 daily buses daily from Bratislava Airport, stopping also at Novy Most (city center) and Bratislava Petrzalka (Einsteinova St.) Stops also at Vienna Airport and arrives at Erdberg (Subway U3) in about an hour. €6/€11 return. Postbus/Slovak Lines. 19 daily buses from Bratislava main bus station at Mlynské Nivy (8 of them start from Bratislava Airport and then go to Bratislava main bus station), stopping also at Bratislava Petrzalka (Einsteinova ul.) to Südtiroler Platz (Subway U1) in approximately 90 minutes. Intermediate stop at Vienna Airport. €7.70, €14.30 return. eurobus, a. s.. Has frequent buses traveling across Slovakia from their Košice base to across Europe via Vienna. Booking online is possible via their homebuy service. This service also is the best overview of buses between Slovakia and Vienna since it includes all schedules. Nitra €28 return, Košice €42 return. [dead link] Varan, Ticket Office: Südtirolerplatz 7. On Tuesday and Friday to/from Istanbul from Südtiroler Platz bus depot. Istanbul €110/€200 return, Online €104/€190 return. Евроклуб (Euroclub). Arriving Sunday from Kiev via Lvov among others returning on Monday. Departure and tickets from VIB. Kiev €100/€180 return. LOD. Run a fast hydrofoil between Vienna and Bratislava May–October with up to two daily departures. The dock is in the 2nd District on the Danube proper (U1 Vorgartenstraße, Dock 6 on the Danube). Sailing time 13:30 downstream 13:45 upstream. €16/€25 return. Twin City Liner. A fast catamaran between Vienna and Bratislava March–December with up to four daily departures. The dock is in the 1st District at Schwedenplatz. Sailing time 13:15 downstream 13:30 upstream. €17-30. Mahart Passnave. Operate a fast hydrofoil between Vienna and Budapest May–October with daily departures during the peak season. The dock is in the 2nd District on the Danube proper (U1 Vorgartenstraße, dock on the Danube). Sailing time 05:30 downstream 06:30 upstream. The boat only moors Bratislava and Visegrád if arranged. Bratislava €29/€39 return, Visegrád/Budapest €89/€109 return, student discount available. Donauschiffahrt Wurm + Köck. Operate ships between Vienna and Linz. Sailing is slow and expensive but the ships travel through the famous Wachau river valley. Combine tickets including return via train are available. from €12. Enquiries for routes and timetables are possible with the mobile application Qando, that is supplied by the public transport operator. The app is available for Android, IOS and can be accessed without installation on the internet. The entire U-Bahn system has step-free access. Buses are all low-floor, with lifts for full wheelchair accessibility. The tram system runs a mixture of older high-floor and modern low-floor trams. At tram stops with digital displays, it is indicated whether the next tram arriving is step-free accessible. Wiener Linien generally schedules the trams so you won't have to let more than one go by before a low-floor one comes along. Service dogs can be taken anywhere on the system, but if they are not officially registered as such with the Austrian government, they must be muzzled (As a practical matter, the transit authorities will pretty much never question whether an obvious service dog is registered, though). More information about accessibility can be found online. Inside a vintage Viennese tram. Public transportation within the city proper, including most everywhere you are likely to visit (the entire subway and tram network) is a single zone (Kernzone 100). Any transportation can be used: subway, any train – even high-speed ones – as long as you are traveling between two Vienna stations, trams, buses, night buses, and an interurban railway (the Wiener Lokalbahn) within the city limits. Tickets are available at machines (Visa, MC accepted) and from counters at subway and rail stations as well as at tobacco shops ("Tabaktrafik"). They can also be bought online for printout or via a mobile app to present them via the mobile phone. Single Trip Ticket €2.40: A single direction uninterrupted trip to anywhere, with as many transfers as needed (children, bikes, dogs €1.20). Day ticket €5.80. Valid till 01:00 on the following day. Available only online or via the mobile app. 24-hour ticket €8.00: Valid from time stamped. 48-hour ticket €14.10: Valid from time stamped. 72-hour ticket €17.10: Valid from time stamped. Week ticket/Wochenkarte €17.10: Valid Monday 00:00 through next Monday 09:00. If you are staying for a few days and hope to do tons of sightseeing and/or shopping, the Vienna Card (Wien Karte) is a good deal. It costs €29.00 and is good for 72 hours of unlimited public transit within Vienna. The card also gets you discounts (typically €1 or €2 at the major museums and art galleries) to many attractions and shops. You can buy it at the airport, hotels, and underground stops. The Vienna Card allows one kid aged less than 15 to travel with the owner, possibly making it more attractive. One Vienna Card allows shop/museum rebates for the whole family. See the Vienna International Airport for details on transfer to/from the airport. The five U-Bahn lines U1 U2 U3 U4 U6 are the most common way of getting around Vienna. These underground, metro or subway lines have trains during the day every 1½–5 minutes and cover most of the important parts of the city and sights. In the nights to saturdays, sundays and public holidays in Austria all lines are running also at night (all 15 minutes), you don't need a special ticket to use the nightline. In 2009 the yellow tourist Vienna Ring Tram was established, which travels around the Ringstraße for €9 and has an audio guide in several languages. The famous 'ring lines' 1 and 2, however, will give you the exact same view and are covered by Vienna's normal fare zone. You can take tram 1 (bound for Prater-Hauptalle) from Oper to Schwedenplatz and take tram 2 (bound for Ottakring) from Schwedenplatz back to Oper. Vienna's suburban rail network is often overlooked by tourists. It comprises three types of trains: S-Bahn (S), which mostly serve inner suburbs and stop at all stations with few exceptions, Regionalbahn (R), which are generally more long-distant than the S-Bahn and make limited stops on parallel S-Bahn routes, but otherwise all stops, and RegionalExpress (REX), which mostly serve the outermost suburbs and make very limited stops in the inner suburbs (although not all RegionalExpress trains are suburban trains). The network also stretches over the borders of the neighbouring countries. Stammstrecke (Meidling–Hauptbahnhof (main station)–Quartier Belvedere–Rennweg–Mitte–Praterstern–Floridsdorf) trains run every 2–5 min. This is not a line itself but rather the result of the bunch of lines using the same stretch. The Wiener Lokalbahn (WLB) also referred to as the Badner Bahn is an interurban railway traveling from the Opera running as a tram on-street southwest through Vienna to Meidling station where it becomes a railway continuing onwards through the 23rd District and through suburbs and the rolling wine hills in Lower Austria to Baden. Within Vienna proper, it's covered by the same zone 100 ticket as the rest of the tram system, but you need an extra ticket to take it out into the suburbs. The regular trams, trains and buses run until about 00:30 (just past midnight). Most of the commuter rail is shut between 01:00 and 04:00. On Friday and Saturday (and on nights before holidays), the entire U-Bahn network runs all night. Additionally, a dense network of night buses, called "NightLiners" is available every night of the year. Regular tickets are valid. Most buses terminate at "Kärntner Ring, Oper", which allows for easy interchange. Intervals are every 15-30 min. Daytime service resumes at 05:00. Be careful when parking near tram tracks. Make sure the side of your car does not block the path of the tram. Otherwise the tram will be forced to stop and your car may be towed. Pay attention to tram tracks in the street, and when crossing them, approach them from as close to perpendicular as possible, otherwise your tires can get caught in the groove next to the rail. If your destination is in the outer suburbs, or you want to take a relaxed ride to the countryside, you may consider taking your bike on the U-Bahn (prohibited at rush hour, and always in buses and trams) or on a train. You need a ticket for your bike in trains. On the U-Bahn (metro) it is free to transport your bike on workdays from 09:00-15:00 and after 18:30 and for the whole day on weekends. CityBike runs a short-term shared bike system all over the Vienna city. There are many stations in the inner districts and you can register to borrow a bike with your credit card (€1/to register) or obtain a Touristcard (€2.50/day). The first hour is free, the next €1, the third €2, etc. So always return your bike as soon as you have finished riding. 15 minutes after you return it, you can rent another or the same bike with a new free hour. Foreign credit cards work fine in the machines - but you need one credit card per person. You can't hire two bikes with one card. Vienna has a rich history as the capital city of the monarchy, and thus, there is an abundance of historical buildings and museums. Most of these, including Stephansdom (St. Stephen's Cathedral) and the three most well-known museums, Kunsthistorisches Museum (Museum of Fine Arts), Naturhistorisches Museum (Museum of Natural History) and Albertina, are located in the Innere Stadt. The Ring Road (German: Ringstraße) is a circular road surrounding the Innere Stadt district of Vienna and is one of its main sights. Its architecture is typical of the eclectic, historicist style called Ringstraßenstil (Ring Road Style) of the 1860s to 1890s. Built in the style of the Renaissance according to plans by Heinrich von Ferstel, the MAK- Austrian Museum of Applied Arts/Contemporary Art is the first museum building on the Ringstraße. The Schloss Schönbrunn palace, a part of the UNESCO World heritage list, is located in the Outer West area. From May to December you can attend concerts of the Vienna Hofburg Orchestra which take place in the Festival Hall and the Redoutensäle of Vienna's Hofburg Imperial Palace. The orchestra's program is composed of Viennese waltz and operetta melodies by Johann Strauss, Franz Lehár and Emmerich Kálmán along with opera arias and duets by Wolfgang Amadeus Mozart. Each year on the evenings of December 31 and January 1 the Vienna Hofburg Orchestra performs traditional Viennese New Year's Eve and New Year's Concerts in the Hofburg's festival halls. These concerts however, along with those that are from similar ensembles, are quite expensive for what they offer, and are intended for the entertainment of tourists. For a more serious program, other concerts at the Musikverein and the Staatsoper can be attended for as little as €3-4 (standing room). They feature some of the best musicians in the world, including of course, the Vienna Philharmonic Orchestra. With concerts starting at almost the price of a cup of coffee, Vienna boasts a frequent and outstanding roster that is financially accessible to all. Much of the musical scene in Vienna is absent during the summer months, with the exception of the ensembles that cater to tourists. The solution would be to travel to Salzburg, where the Vienna Philharmonic resides during the summer. Store hours are generally M-F 08:00 or 09:00 to 18:00 or 19:00, and Sa 09:00 to 18:00, closed Sunday. There are slightly longer hours at some malls. Credit cards are normally accepted at large and at high-end stores. All chains that you can find in the malls also have stores on the city's shopping streets, which tend to be more accessible and tourist friendly. Flea markets are usually can be found on Sundays, where one can buy items at very reasonable prices. There are 21 markets with stands and small characteristically Viennese hut-like shops that are open daily (except Sunday). Additionally many of these have true farmers' markets, often on Saturday mornings. There is a large variety of sellers and markets, from the upscale to the dirt cheap. Each has several shops of different kinds (butcher, bakery, produce, coffee, etc.) There is another handful of weekly farmers markets around the city and seasonal markets like the Christmas Markets. Open from November 15 or 20 to December 23 or 24, most Viennese Christmas Markets ("Christkindlmarkt", "Adventmarkt" or simply "Weihnachtsmarkt") are not so much for shopping as for eating and drinking. From midday until the late hours of the night, people gather at Christmas markets to drink mulled wine, punch, and chat to one another and the occasional stranger. Entry to all of these markets is free. While Vienna can be a delightful place to visit during the Christmas season, on December 25 and 26 the city is largely shut down. Belvedere. Another addition to the city's Christmas markets, the market in front of the Belvedere palace is spacious and emphasizes the homespun. Viennese supermarkets are not very large, especially compared with the hypermarkets covering the rest of Central Europe. However, there is practically one on every corner. They are open generally M-F 07:00-19:00, Sa 07:90-18:00, later on Sunday and on public holidays, few stores are open: three in train stations (in Westbahnhof to 23:00, in Praterstern and Franz-Josefs-Bahnhof to 21:00), three at the airport (to 23:09) and one at the General Hospital (Allgemeines Krankenhaus, AKH). Hofer, Penny, and Lidl strive to be discount stores, whereas Billa and Spar as well as the larger Merkur tout selection and quality. There is not a major difference in prices. Most regular stores have a deli where the clerks make sandwiches for the cost of the ingredients you select. Although many products are Austrian none of the chains are actually Austrian-owned. If you want to support the local economy more you can do so by frequenting independent shops or visiting actual markets. Classic Viennese dishes to try are the famous Wiener schnitzel, a thin veal cutlet lightly breaded and fried, and the perhaps less well known Tafelspitz, where a beef roast is simmered in a broth with root vegetables and herbs. 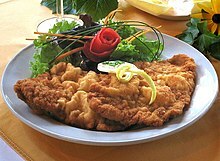 Schnitzel made from pork ("vom schwein") is also popular. By law, restaurant menus are supposed to clarify if anything sold as "Wiener schnitzel" is made from something other than veal. As is common in much of eastern and central Europe, mushrooms are very popular, and when they're in season, you'll find a plethora of varieties on restaurant menus and for sale in markets, often for surprisingly low prices, at least if you're from North America. Chanterelles for €10/kg, anyone? Viennese restaurant portions tend to be large. Many restaurants now include vegetarian options. Most restaurants have daily specials listed on a chalk board or sometimes on a printed insert in the regular menu. These are usually the best bet, though they may not be on the English menu, so you may have to ask to have them explained or try to translate them yourself. Smoking is ubiquitous in Viennese restaurants. Restaurants are required by law to have separate non-smoking sections, however, so do ask to be seated there if you feel the smoke may bother you. When making a reservation, you should mention what area you want to be seated in. At outdoor tables, neighbors' smoke may be bothersome. It is polite to ask tablemates' permission before lighting up after a meal. Hotel breakfasts vary, but typically consist mainly of a buffet with a variety of rolls, cold cuts, and cheese. Fruit, yogurt, muesli, and often other types of cold cereal are also typically available. Many places will cook some eggs if you ask, or sometimes, especially for guests that are American or British, will offer to do so, but that's mainly seen as something for foreigners, cooked breakfasts not being typically Viennese, and you're unlikely to find any cooked food besides eggs on offer. Still, while the overall style may be "continental," Viennese breakfasts are often considerably more substantial than many other parts of Europe. Vienna being a fairly cosmopolitan city, there is a wide variety of international cuisine available. Italian and Greek food are particularly popular. Don't expect "service with a smile" at a Viennese restaurant or cafe. While some servers are friendlier than others, most practice a level of reserved formality that can strike foreigners from more outgoing cultures as austere or even rude. It isn't intended that way, it's mainly a cultural expectation that service should be unobtrusive. So don't be offended if a server doesn't volunteer to discuss the specials or if they don't come to check on you while you're eating - the general expectation is if you want something, you'll get their attention and ask for it, otherwise they should leave you alone. The traditional Viennese fast food is sausage in all shapes and sizes. You can buy hot sausages and hot dogs at snack bars called "Würstlstand" all over the town. The famous Wiener Würstel is known as "Frankfurter" in Vienna, but many inhabitants prefer Bosna (with onions and curry), Burenwurst, and Käsekrainer or "Eitrige" (with melted cheese inside). A würstlstand will typically give a choice of sausages served as a "hot dog" (not a North American hot dog, it just means any kind of sausage served in a bun) or "mit brot" ("with bread," i.e. cut into bite size chunks and served with a small disposable fork, with a roll on the side). You typically get a choice of mustard or ketchup and (rarely) other condiments, which the server will put on for you. Roast chestnuts ("Maroni") are a common snack during the colder months, and are sold from street stalls all over the city, especially near train and U-Bahn stations, and at Christmas markets. In addition to this, the local snack culture also includes more ex-Yugoslavian and Turkish varieties of fast food, such as the Döner Kebap, sandwiches of Greek and Turkish origin with roasted meat, lettuce, tomatoes, onions, and yogurt and/or hot sauce. Places that sell kebap often sell takeaway slices of pizza too. Good kebaps can be bought at the Naschmarkt. The lower end of the Naschmarkt (further away from Karlsplatz or city centre) is cheaper than the upper end (closer to Karlsplatz), and the right lane (facing away from the city centre) is reserved for mostly sit-down eateries. Another good place to find snacks (especially while going out) is Schwedenplatz. By far the cheapest way to get a fast food meal in Austria (and probably the only meal available for just over €1) is buying an Austrian sandwich (sliced brown bread + ham/cheese + gherkin) from a supermarket. Supermarkets with a deli counter (Feinkostabteilung) will prepare sandwiches to take away at no extra charge. You only pay for the ingredients. There is usually a large selection of meat products, cheese, and bread rolls available here, too. You point at the combination you want, can also mention the max total you can pay, and then pay at the cash register. One of the favorites is the "Leberkäsesemmel", which is lightly spiced, very finely ground meat baked in a pan, sliced, and served on a roll. If you know a bit of German, you'll note that "Leberkäse" literally translates to "liver cheese," but it contains no cheese and the Viennese version contains no liver. Freshness and quality at the grocery stores are normally better than at a sandwich stand on the street. Vienna's Kaffeehäuser (coffee houses) are world famous for their grandness and the lively coffee house culture. Skipping the Kaffeehauskultur is missing out a big part of Viennese culture. You should at least visit one of the countless traditional baroque 19th- or funky 20th-century coffee houses where you can sit down, relax, and enjoy refreshments. Remember: cafés are a very slow-paced environment, approach them as you would a sit-down restaurant, bring a book or some friends, or make use of the newspapers on hand and enjoy your hours relaxing there! Großer Schwarzer is a double Schwarzer (similar to a double espresso). Also consider specialties like the Kaisermelange (coffee, milk, egg yolk and cognac) on the menu. Most cafés have a house specialty (for instance, "Kaffee Central" at Café Central). Many coffee houses have a huge selection of international newspapers. Finding a café is not hard in Vienna; Finding a particular café you are looking for is another story. Most of the baroque "top" coffee houses are on the Ring and main streets of the Innere Stadt, mostly cozier and often less formal 1970s or 80s modern-style coffee houses are hidden away on the Innere Stadt's backstreets, and distributed across the rest of the city (4th district, 7th district, 8th district, Outer West districts, ..). Oberlaa. Very Viennese cafes, really delicious bakery and well known confectionery. Also some choice of soups and mains. Several locations, mostly in Innere Stadt. Melange €3.70; Slice of Torte €3.50. Rather unusually it is necessary to say some words about Vienna's drinking water. The majority of Vienna's water comes from the three "Hochquellwasserleitungen." Meaning "high-(as in mountain) spring waterlines (as in aqueducts). Indeed the city's water flows through aqueducts from the mountains around 100 km south of Vienna (Schneeberg and Hochschwab). These were built during the reign of Emperor Franz Josef and supply Vienna with unchlorinated high-quality drinking water, with a considerably higher quality than many bottled waters. So if you visit this city, it is not necessary to buy water. You can simply drink tap water here unless you prefer sparkling water. Another speciality is that at typical coffeehouses a coffee is often accompanied by a glass of cold clear water. In most restaurants, you can get a glass of drinking water for free with any order, just specify tap water ("Leitungswasser"). New wine is usually enjoyed at a Heurigen (family-run vineyard bars allowed to the new vintage). Austria in general, but especially the area around Vienna, produces quite a large amount of wine each year. There are even many vineyards within the city in Döbling (19th District). The wine is not often exported and white is more common than red. Grüner Veltliner is a common tart and fresh white wine served almost everywhere. Officially the new wine season begins on November 11 (St Martin's Day), but as early as September, some partially-fermented new wine (called Sturm which is cloudy, because it has not been strained) is available around town at stands and in 2L green bottles (try the Naschmarkt – sometimes the vendors will have samples of this drink, which at about 4% alcohol is less strong than wine). Taverns can call themselves Heurigens whether the wine they serve is their own or not – for genuine in-house product look for a Buschenschank. This is a particularly Viennese Heuriger which can only be open 300 days per year or until their supply of house-made wine runs out. Heurigen can be found e.g. in Grinzing, Sievering (19th district) and Mauer & Rodaun (23rd district) areas, but also in almost every suburban area in Vienna. Even in the center, there are some Stadtheurigen. While the Heurigen of Grinzing are bigger and more famous with tourists, they are often a rip-off. If any of the year’s vintage lasts until next year, it officially becomes Alte (old) wine on the next Saint Martin's Day. The Heurigen in the South of Vienna or in Perchtoldsdorf are much cheaper and serve the same quality as the Heurigen in Grinzing. Also in the Northern suburbs, you can find cheap and somewhat authentic Heurigen. Try the areas of Stammersdorf or Hagenbrunn, for example Karl Matzka, hard to reach by public transport. After a long day, the perfect place to relax among Viennese are the Heurigen in the suburbs. Somewhat akin to a beer garden, except with wine, these tiny treasures are the only places authorized to serve new wine. New wine is made from the first pressing of the grape and can appear a little cloudy. Be careful, it's stronger than you might think! This is why it's served in very small glasses, 0.25L and up. Some Heurigen serve food, either elaborate Viennese specialties or very simple bread and cheese platters. No matter which one you choose, you're guaranteed to enjoy yourself. Just hop on a convenient outbound tram line, take it to the very last stop, and look for buildings with large, evergreen foliage hung over the doors. Each one is unique, but all are a good bargain. Locals invariably have a favorite: ask around. Glühwein is hot, sweetened red wine with cinnamon and cloves, served from stalls at Christmas markets. Some markets have a peculiar system where you'll be asked for a deposit on the mug the wine is served in, and when you're finished, you can return it to any glühwein vendor at that market to get your deposit back - payments are worked out among themselves through some mysterious process. Wein & Co, ☎ +43 1 743 42 00-34. A chain shop for wine lovers featuring a wine bar in every location. Shop locations include Naschmarkt, Mariahilfer Straße, near Burggarten and near Stephansplatz. Gürtel at Nussdorfer Straße (U6) has a few mid-size cheap clubs like Loco and Ride Club around. They all have very cheap booze and cover if you arrive early. Why Not. Is Vienna's mainstream everyday gay disco. The crowd is varied. In the 1st District at Tiefer Graben 22 (Herrengasse U3). Saturdays are house music free. HOMO is the other mainstream alternative gay party that happens every now and again, sometimes in Heavan @ Camera Club (see above). Brothels are legal in Vienna, as is street prostitution. There are male and female prostitutes, many from Austria's neighboring countries (few from Austria), but also from Africa, Latin America and Asia offering their services. Brothels differ greatly from small to the point one-room operations to hokey grand parlors. There is no true red-light district, but there are many 'bars' located on the 'Gürtel' as well as in the 2nd District, but they can be found everywhere. Street prostitution areas exist but should be avoided due to the lack of regulation and high number of trafficked and unregistered workers. There are plenty of go-go clubs as well, though, that are not brothels. Some of these have male and female dancers dancing together and are frequented by men and women together. Vienna is a major tourist hotspot and offers a complete range of accommodation options. Prices are relatively higher than in neighboring countries, or even in the rest of Austria. Many of the Viennese hotels, hostels and pensions, especially its centre, are housed in historic buildings dating from before the Second World War, most from the 19th-century Gründerzeit. This means that quite many offer relatively small rooms with sometimes compromised views, and rooms within the same property can vary widely, even at the same price. You will probably find that Viennese hotels usually offer very traditional decor, bathrooms with bathtubs and, again, relatively space-limited quarters. There are very few "modern design" hotels, and those looking for American-style over 30m² rooms should do good research before booking and make sure their booked room matches the expectations. On balance, breakfasts in Vienna are usually relatively good, with a good variety of products, even at the less pricey establishments. Moreover, you can count on many local cafes to offer you breakfast should your booking not include one. A typical Viennese hotel breakfast is buffet-style and fairly substantial, and consists of bread and rolls (usually very good quality), a variety of cold cuts, and fruit, as well as meusli and other cold cereals, and juice and coffee. In choosing an accommodation it is important to know which part of the city you want to spend time in. Most accommodations claim to be centrally located, which for the Viennese would mean they should be in or next to the 1st District, few actually are. Many are even outside the core districts 2-9. Still, from the ones located within a 5-minute walk of an underground or at least a rail or tram station, you should be able to get to the center within 20 minutes or less on public transportation. Smoking rooms are relatively common. Non-smoking rooms are in limited supply, and hotels with non-smoking floors are less common. Sensitive non-smokers may be bothered that public areas of the hotel, including the hallways, are often heavy with tobacco smoke. During summer there can be several days where the temperature is over 30°C. There are very few hotels that have air conditioning. People who are used to sleeping in a cool environment should seek out hotels that have air conditioning or schedule their trips during those times of the year when the temperature will be cooler. MuseumsQuartier has free internet, lots of outdoor seating - and quite a few world-class museums to boot! Vienna has a large number of mostly free wireless hotspots in bars, restaurants, and cafés (see drink section). Wifi is known locally as WLAN or Wireless LAN. Those that are on the Freewave Wi-Fi network can be found here. MuseumsQuartier has free wireless internet. There are plenty of internet cafes except for in the first district. Touchscreen media terminals are available (including internet) in many phone booths, much of the content about Vienna is free. If you plan to visit also places outside the city and you don't want to stay without internet it's recommended to buy a prepaid 3G-simcard (all providers offers fast 3G service, also in rural and remote areas of Austria) and put it in your smartphone or internet USB stick. Download is mostly around 5-6 Mbit/sec and upload 2-3 Mbit. (for HSDPA). The monthly cost for mobile internet is between €4 (1GB) and €15 (unlimited) (August 2011). The best 3G coverage in rural areas is from A1 A1. Vienna is covered very well by HSDPA, HSPA+ and LTE as well. If you're a European student you can make use of the eduroam service. The University of Vienna, the Vienna University of Economics and Business Administration, the University of Technology, the Medical University of Vienna, the University of Applied Arts Vienna as well as the University of Music and Performing Arts are part of this programme in Vienna. Local news, culture, events and guides are printed in English in a monthly magazine called the Metropole – Vienna in English. International papers are widely available. There is a New York Times insert in the Monday edition of the local newspaper Der Standard which can be found quickly in coffee houses and elsewhere due to its tan color. Vienna is potentially one of the safest cities in the world for its size. There are no slums or districts you should avoid. In general, you can visit any part of the city at any time of the day without taking many risks — just use your common sense. The Prater (fair grounds/amusement park area) is said by some locals to be less safe at night, though more in reference to pickpockets than anything else. The Praterstern railway station is a magnet for drunks, homeless people and drug addicts, but they generally do not bother passers-by. As a general rule of thumb, its best to avoid train stations, parks (especially Reumannplatz) and some larger subway stations at night, but even then, nothing bad should happen to you. As in any major city, watch out for pickpockets who grab and run when boarding the U-Bahn. Petty crimes (like jackets 'going missing') are more common and normally go unreported and won't get much sympathy. There have been a very few racist assaults in Vienna (even some by the police themselves). One runs the risk of being pickpocketed. Schwedenplatz, along the Ring, is sleazy in the evenings, but basically harmless; the Stadtpark, along the Ring, to the East, is a bit deserted at night and therefore best avoided. Real Viennese police officers are virtually always honest and polite, and will do their best to assist you if you need them, although many of them have limited to non-existent English skills. If you need to report a serious crime and don't speak German, they will usually manage to round up an English-speaking officer. Pay attention to the tram tracks in Vienna. Unlike other cities, Viennese trams move very fast and can easily kill you if they hit you. The modern Viennese trams are hard to hear as well. If you encounter tram tracks and you must cross the road, make sure to look both ways before crossing. If you park near tram tracks and you have to get off on the same side as the street, make sure to look both ways as well. If you see people gambling on the streets (usually in popular tourists' destinations like Stephansplatz or Mariahilfer Straße), stay away! The modus operandi usually involves a guy playing the classic game of "hiding the ball". This involves covering the ball (or small trinket) with either a bottle cap or a match box and swirling it around with two other bottle caps asking people to guess the position of the ball. The game is set in a way that you can easily see the ball's position. This is done to lure the unsuspecting person into placing a wager. There are usually two main players and, between them, they will lose and win money back and forth to give the appearance that it is a fair game - do not be tricked! They are from the same gang. Once you get greedy and get lured in, you will surely lose your money! The person in control of the bottle caps will remove the ball from their position through sleight of hand and you will never see your money back. Besides the two or three other players involved, there are usually at least two lookouts - one on each side of 'stage'. Vienna has plenty of legal casinos if you care to try your luck. In addition, it is common for suspicious persons to approach you in the city center if you are standing still for a while (particularly if eating at outdoor tables). They will be holding magazines for sale, and will ask you if you are interested in looking at one for free. They are typically very aggressive in their demeanor. Do not be fooled by them! It is not free. If you look at the magazine for free, they will refuse to take the magazine back and demand payment for it at a high cost (typically €2, which is the price of local homeless' magazines in Austria like "Augustin", but they are in German anyways and it indeed has become a trend among non-related people to abuse the idea). The best response in this situation is, when they first approach, to simply wave your hands demonstratively to say no while shaking your head and repeat the phrase "Nein danke" ([naɪ̯n ˈdaŋkə] no thank you) to them repeatedly until they leave. If police are nearby, these people may accuse you of stealing the magazine, but many police know of their trickery so stand your ground. They are not violent and just trying to get money from you, so do not be afraid that they will hurt you if you tell them no. Afghanistan, 9, Lackierergasse 9, ☎ +43 1 5247806, fax: +43 1 5247807, e-mail: afg.emb.vie@chello.at. Albania, 19, An den langen Lüssen 1/6/1, ☎ +43 1 328865657. Algeria, 19, Rudolfinergasse 16-18, ☎ +43 1 3698853. Argentina, 1, Goldschmiedgasse 2/1, ☎ +43 1 5338577. Armenia, 14, Hadikgasse 28, ☎ +43 1 5227479, fax: +43 1 5227481, e-mail: armenia@armembassy.at. Australia, 4, Mattielistraße 2-4, ☎ +43 1 51285800. Belarus, 14, Hüttelbergstraße 6, ☎ +43 1 419963011. Belgium, 4, Wohllebengasse 6, ☎ +43 1 502070. Belize (Consulate), 1, Franz-Josefs-Kai 13, ☎ +43 1 5337663. Bosnia and Herzegovina, 12, Tivoligasse 54, ☎ +43 1 8118555. Brazil, 1, Lugeck 1, ☎ +43 1 51206310. Bulgaria, 4, Schwindgasse 8, ☎ +43 1 5056444. Canada, 1 Laurenzerberg 2/3F, ☎ +43 1 531383000, e-mail: vienn@international.gc.ca. Chile, 1, Lugeck 1/III/10, ☎ +43 1 5129208. China, 3, Metternichgasse 4 (梅特涅大街4号), ☎ +43 1 7103648, fax: +43 1 7136816. Colombia, 1, Stadiongasse 6-8, ☎ +43 1 4054249. Croatia, 17, Heuberggasse 10, ☎ +43 1 48487830. Cuba, 13, Himmelhofgasse 40a-c, ☎ +43 1 877819830. Cyprus, 1, Parkring 20, ☎ +43 1 5130630. Czech Republic, 14, Penzinger Straße 11-13, ☎ +43 1 8943741. Denmark, 1, Führichgasse 6, ☎ +43 1 51279040. Ecuador, 1, Goldschmiedgasse 10/2/2, ☎ +43 1 5353208. Egypt, 19, Hohe Warte 50-54, ☎ +43 1 3708104, e-mail: egyptembassyvienna@egyptembassyvienna.at. 09:00-17:00. Finland, 1, Gonzagagasse 16, ☎ +43 1 531590, fax: +43 1 5355703, e-mail: sanomat.wie@formin.fi. M-Th 08:15-12:00, 13:00-16:30, F -15:45. France, 4, Technikerstraße 2, ☎ +1 2029446000. 48.20824116.3563181 Georgia, 1, Doblhoffgasse 5/5, ☎ +43 1 4039848, fax: +43 1 4039848, e-mail: vienna.emb@mfa.gov.ge. 09:00-18:00. Germany, 3, Metternichgasse 3, ☎ +43 1 711540. Greece, 4, Argentinierstraße 14, ☎ +43 1 50557910, e-mail: gremb@griechischebotschaft.at. Hungary, 1, Bankgasse 4-6, ☎ +43 1 5332631. India, 1, Kärntner Ring 2, ☎ +43 1 2225058666. Indonesia, 18, Gustav-Tschermak-Gasse 5-7, ☎ +43 1 476230, e-mail: unitkom@kbriwina.at. Iran, 3, Jaurèsgasse 9, ☎ +43 1 7122650. Iraq, 1, Johannesgasse 26, ☎ +43 1 7138195. Ireland, 1, Rotenturmstraße 16-18, 5th floor, ☎ +43 1 7154246. Israel, 18, Anton-Frank-Gasse 20, ☎ +43 1 476460. Italy, 3, Rennweg 27, ☎ +43 1 71251210. Japan, 1, Heßgasse 6, ☎ +43 1 53192. Kazakhstan, 19, Felix-Mottl-Straße 23, ☎ +43 1 367917510. Kenya, 3, Neulinggasse 24, ☎ +43 1 71239190. Democratic People's Republic of Korea, 14, Beckmanngasse 10, ☎ +43 1 8942313. Republic of Korea, 18, Gregor-Mendel-Straße 25, ☎ +43 1 47819910. Kosovo, 4, Goldeggasse 2, ☎ +43 1 9047466. Macedonia, 9, Kinderspitalgasse 5/2, ☎ +43 1 5248756, fax: +43 1 5248753, e-mail: vienna@mfa.gov.mk. Malaysia, 21, Floridsdorfer Hauptstraße 1-7/24F, ☎ +43 1 5051042. Norway, 3, Reisnerstraße 55-57, ☎ +43 1 71660, fax: +43 1 7166099, e-mail: emb.vienna@mfa.no. Poland, 13, Hietzinger Hauptstraße 42C, ☎ +43 1 87015100, e-mail: wieden.amb.sekretariat@msz.gov.pl. Romania, 4, Prinz-Eugen-Straße 60, ☎ +43 1 5053227, fax: +43 1 5041462. M-F 08:30-17:30. Saudi Arabia, 19, Formanekgasse 38, ☎ +43 1 3672531, fax: +43 1 3672540, e-mail: Emb.at@mofa.gov.sa. Serbia, 3, Rennweg 3, ☎ +43 1 7132595, e-mail: ambasada@scg-diplomat.at. Sweden, 2, Obere Donaustraße 49-51, ☎ +43 1 217530, e-mail: ambassaden.wien@foreign.ministry.se. Turkey, 4, Prinz-Eugen-Straße 40, ☎ +43 1 5057338 (24 hours), fax: +43 1 5053660, e-mail: webmaster@tuerkischebotschaftwien.eu. Ukraine, 18, Naaffgasse 23, ☎ +43 1 4797172, fax: +43 1 479717247, e-mail: emb_at@mfa.gov.ua. United Kingdom of Great Britain and Northern Ireland, 3, Jaurèsgasse 12, ☎ +43 1 716130. Vienna's metropolitan area is large, and its suburban rail takes you to suburbs so large that they are worth a visit in their own right. All of the following places are within the metropolitan area and reachable on an all-zone Vienna travelcard (and yes, this also applies to Sopron). Krems, a smaller and historic town at the entrance of the Wachau valley about 80 km east of Vienna. Reachable by rail from Wien Franz-Josefs-Bahnhof, Wien Spittelau (U4, U6) and Wien Heiligenstadt (U4) with suburban trains to "Krems/Donau". There are hourly connections and the travel time is about one hour. Krems is relatively small, so you can walk there or rent a bike. Baden bei Wien, is a smaller historic town 25 km south of Vienna. Famous for its bathes and thermal waters. It features many beautiful buildings and parks from the Biedermeier period. There is a direct tram line going from the Vienna Opera to Baden otherwise faster trains are available too. St. Pölten, the capital of Lower Austria, hosts many sights. One is the Dom zu St. Pölten, a baroque church which until 1722 served as a Roman basilica cathedral. The St. Pöltner Rathaus (city hall) and the Pottenbrunn Castle (which can only be seen from the outside) are also worth a visit. St. Pölten is accessible by an hourly suburban rail service from Westbahnhof station (U-Bahn U3) which takes 80 minutes to St. Pölten (passengers for Pottenbrunn Castle should get off at Pottenbrunn, one stop before St. Pölten). Total travel time from the city centre is 100 min. Wiener Neustadt also has a lot to offer for tourists: the cathedral, renovated in 1975-1999, the castle and the city museum to name a few. The city is reachable by suburban train from Wien Mitte station on the S-Bahn S6 (via Ebenfurth) and S9 (via Baden) routes, and the travel time is 75-80 min. Eisenstadt, the capital of Burgenland, hosts several large churches as well as the Esterházy castle which offers a wine cellar, gift shop, guided tours, and concerts in the famous Haydnsaal as well as the large garden on the back. There are two suburban rail connections: the direct service Hauptbahnhof - Eisenstadt - Wulkaprodersdorf - (Wiener Neustadt) which takes 67 min to Eisenstadt, and the Deutschkreutz-bound service from Meidling to Wulkaprodersdorf + connecting service on the Hauptbahnhof route (opposite direction, towards Hauptbahnhof) to Eisenstadt, which takes 1 hour from Meidling and is thus slightly faster. However, from the city centre both routes take 80 minutes so you might as well go with the direct service from Hauptbahnhof. Sopron, a historic town in Hungary which is also reachable by suburban rail: from Wien Meidling (U-Bahn U1 to Südtiroler Platz and suburban train to Meidling) the hourly service to Deutschkreutz takes you to Sopron in 70 min. Total travel time from the city centre is 90 minutes. Salzburg is the fourth largest city in Austria. Its "Old Town", with its world famous baroque architecture, is one of the best-preserved city centers in the German-speaking world and was listed as a UNESCO World Heritage Site in 1997. There are direct trains from Vienna taking 2.5 hours. Graz is the second-largest city in Austria. The City of Graz including its historic centre and Schloss Eggenberg is a world heritage site. There are direct trains from Vienna taking 2.5 hours. Bratislava, the capital of Slovakia, is 55 km from Vienna and reachable by two suburban rail routes: one runs to Hlavna stanica via eastern Vienna and the other one to Petrzalka via the southeast. The latter takes 57 minutes and the former 71 minutes. Both lines originate at Hauptbahnhof station (U-Bahn U1 to Hauptbahnhof / Südtiroler Platz or suburban train to Hauptbahnhof). However, depending on your point of origin, taking U-Bahn U2 to Stadlau or U3 to Simmering and suburban train from either to Hlavna stanica may be faster than travelling via Hauptbahnhof. Travel time from the city centre via Hauptbahnhof (to Petrzalka) or Stadlau (to Hlavna stanica) is 75 min. Prague, the capital of the Czech Republic, is a very well preserved medieval city. The city's historic buildings and narrow, winding streets are testament to its centuries-old role as capital of the historic region of Bohemia. Innsbruck, regional capital of Tyrol and largest city in the Alps. Budapest, the capital city of Hungary, is a beautiful city located on the banks of Danube. It is a UNESCO World Heritage site for the cultural and architectural significance. This city travel guide to Vienna has guide status. It has a variety of good, quality information including hotels, restaurants, attractions and travel details. Please contribute and help us make it a star! This travel guide page was last edited at 12:23, on 20 April 2019 by Wikivoyage user MSG17. Based on work by Wikivoyage users General Darian, Ibaman, VopiEva, Maltatal and Beeelb, Wikivoyage anonymous users 51.9.171.34, 2607:FCC8:AF82:F000:55F0:385F:D32C:B04, 2607:FCC8:AF82:F000:CD53:2087:582E:AB4E and 74.129.245.133 and others.